It’s challenging to come up with birthday wishes for someone, let alone someone that’s turning sixteen years old. So, we’ve come up with a wonderful collection of wishes that are sweet, funny, and just plain sappy and sentimental. 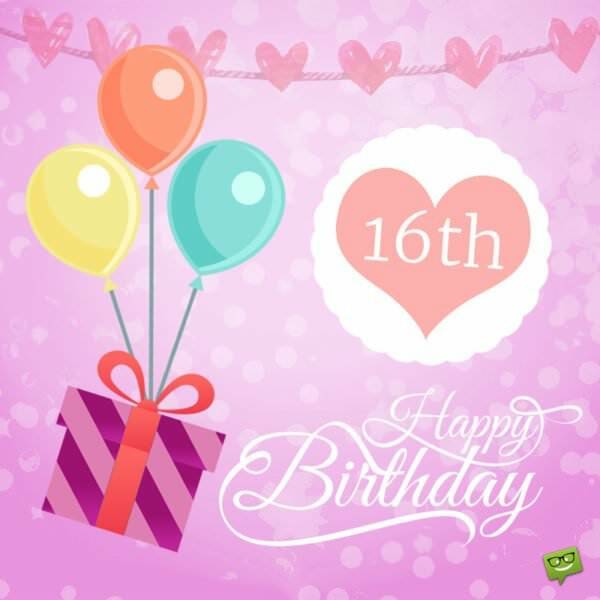 You are sure to find the perfect birthday wish for the one you are wishing a happy sweet 16th birthday to. These birthday wishes are sure to inspire you to craft the perfect greeting for the sixteen year old in your life. Sixteen-year-olds are unlike any other person on the planet, they have been so excited for this day since probably the day they were born. 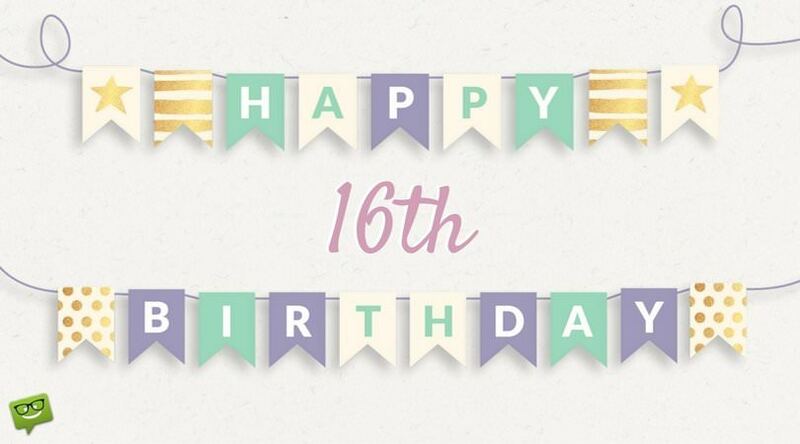 The Sweet 16th birthday has been featured on television shows and has definitely built up a lot of expectations for the birthday boy or girl in your life. Don’t let a boring, generic card start things off on a poor foot, try something a little more unique and suited to their personality. Happy Birthday to the Sweetest 16 year old I know! You have grown into such a beautiful young woman, inside and out! Best Wishes as you celebrate your big day! 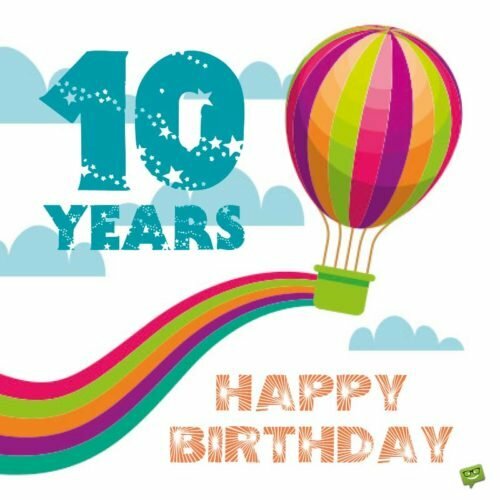 Sweet 16–I hardly know what to say?! May this year be your best year yet and may you receive an abundance of blessings! You have grown into being quite the fine young man. I couldn’t be more proud of you. May your 16th birthday be memorable and wonderful. Hip-hip-hooray! It’s your big day! 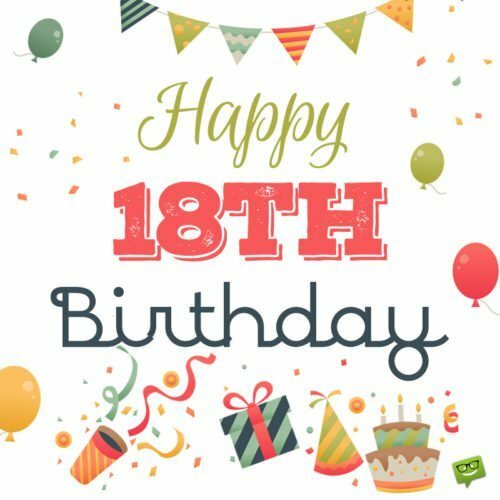 May your 16th year be your best year yet! I know it will be a tremendous success! Happy Sweet 16th Birthday! 16 years and you’ve already accomplished so much! I can’t wait to see what 16+ more will bring! You are continually impressing me with your maturity and intelligence—you are far too wise for your years! Happiest Birthday to you! Happy Birthday from me to you! May your year be full of surprises and wonderful things around every corner! Enjoy your 16th birthday to the fullest! Happy Birthday! Happy Birthday to my sweet 16 year old! I can’t believe the year has finally arrived—I didn’t think we would survive those angsty pre-teen years! Much love to you on your big day! Happy Birthday! May you live long and prosperous! In the words of the great Yoda “Do or do not, there is no try!”. Sugary sweet and delightful: it must be your special day! Congratulations on turning sixteen! Happy Birthday to someone so delightful and wonderful that I just couldn’t imagine life without them! You are an incredible human being, inside and out! Many blessings being sent your way! Happy Sweet 16th Birthday! Much love and many good thoughts being sent your way. You have a beautiful life ahead of you and its only just beginning! Enjoy this very special day! You put the sweet in sweet sixteen. Happy Birthday to you! Happy Birthday to you! You look like a monkey and you smell like one too! Love the only person who could get away with saying that—your sibling! Have a great day…in the zoo! No, I don’t have the keys to your new car in my pocket. No, I don’t have your new car parked out in the driveway. Yes, I do have a big ole’ whopper of a birthday wish for you! Happy Birthday to one amazing 16 year old! If I could give you anything it would be to keep you the confident, radiant, beautiful human being you are right at this moment for all the years to come. You’ll never be 16 again, enjoy this wonderful, mysterious, challenging, fun age to the fullest! Happy Sweet 16th Birthday. May you be surrounded and all-encompassed in a massive sea of joy, love, family, and friendship. You are truly one sweet girl! My wish for you today is simple, have the very best day and make the absolute most of your special day! You only turn 16 once so get out there and enjoy the heck out of it! 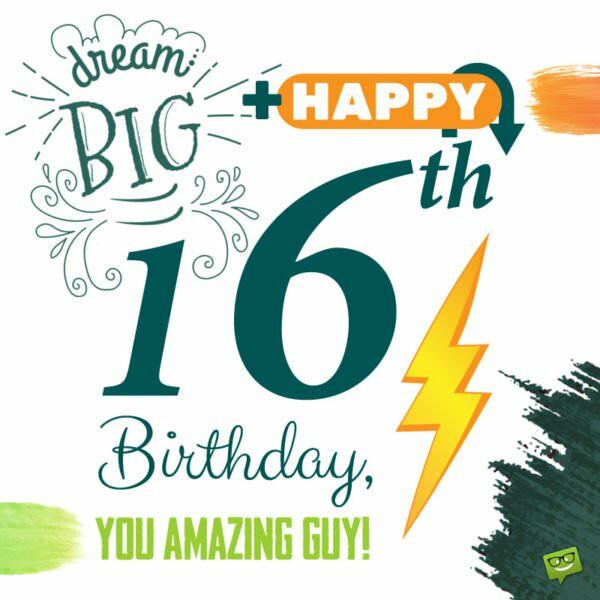 If your Sweet 16th Birthday is as special and amazing as you are—you are going to have one absolutely earth-shattering, amazing, fantastic birthday! In the words of Marie Antoinette “Let them eat cake!”. Best wishes! Now let’s go eat some of that delicious looking cake! From me to you. Happy birthday! I hope your day is as wonderful as you are—which is pretty darn wonderful! Wishing you the very best! Please enjoy this big day. You only get to be an actual teenager 3 more years before you transform until an adult and get to not-enjoy things like water bills, car insurance, and taxes! You are the bravest, most courageous 16 year old I have ever met! May you squeeze the heck out of this 16th year of your life! May you do things you never thought you could. May you try things you never thought you would. This year you will do things you previously thought were unattainable. You will conquer them and zip right past them. Best wishes to a beautiful human being. I hope your 16th birthday is positively magical. Enjoy everything about your special day. Dream Big + Happy 16th Birthday, you Amazing Guy! You are on the cusp of becoming an adult but you’re just not quite there—thank God—enjoy these last few years of non-adulthood while you can. You can do whatever you set your mind on! Happy Birthday. From one old person to one really young person, drink ginger ale when you have tummy trouble and get out and travel while you still can. It’s pretty incredible to be enjoying life as much as you do. Your passion for life is contagious and inspiring. Happy birthday, you amazing person! What do you want for your birthday? You want the moon? I’ll throw a lasso around it and bring it down for you. Whatever your heart desires will be yours today. Just say the word! Happy Birthday to someone really special to me! May you always think of life like “It’s a Wonderful Life”. It’s time to party! Who is up for in da club because it’s your birthday? Yup! You got that right. It’s YOUR big, special day. 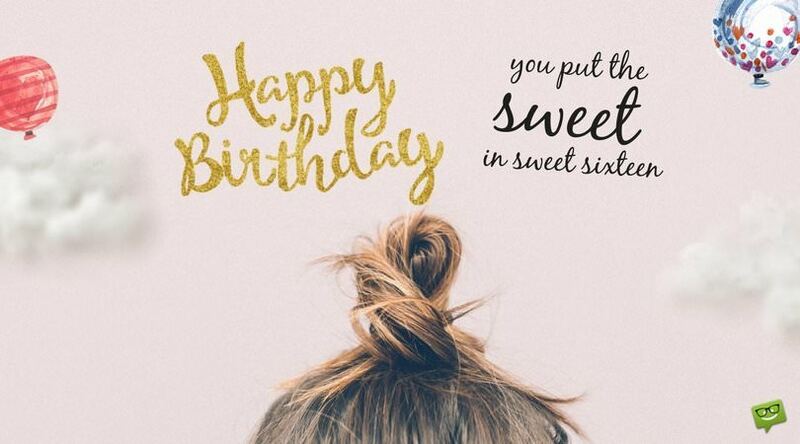 It’s finally arrived—you are sweet 16! Happy Birthday to my best girl friend! Sweet and sassy 16! I never thought this day would arrive and now here it is—my precious little girl is only 16 years old, yet nearly a grown young woman! Happy birthday, my child. No matter how old you get or how big you are–you will always be my little girl! 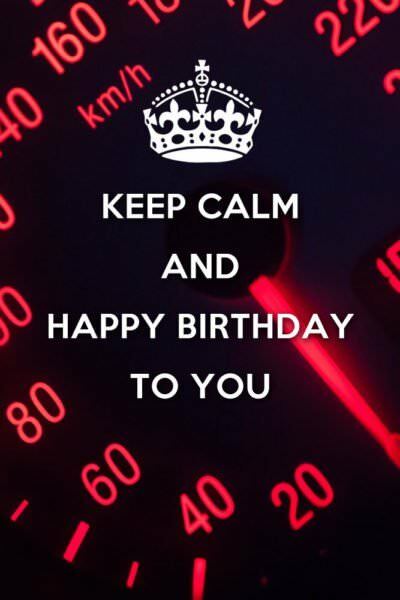 Keep Calm and Happy Birthday to you. My whole world changed the moment the doctor placed you in my arms for the very first time. Best wishes, son. May you know nothing but happiness all your life. I love you. Son, on your 16th birthday, may God bless you abundantly and grant you all the desires of your heart. Happy birthday, son. You have always made me proud. And on a special day like this, I just want to reassure you of my never-ending love and support. I can’t believe how fast you’ve grown up. It’s incredible how you were just a baby yesterday. Today, you’re all grown up. Happy birthday to you, my lovely son. I hope you enjoy every second of this day. I love you now and forever. Happy 16th birthday to you, son. As you celebrate your birthday, know that we treasure you and will do anything to put a smile on your face. We love you so much! May happiness always be your companion throughout this new and exciting stage of your life. Have an amazing birthday. We love you, son. Never forget that! Yay! You’ve finally turned 16, which means you can officially drive and do so many other cool things. Son, I hope you enjoy every second of this special day. Sending you oceans of love, kisses and hugs on your special day. May God fill your heart with all the happiness and love it can hold. Happy 16th, dear son. We are so proud of you. 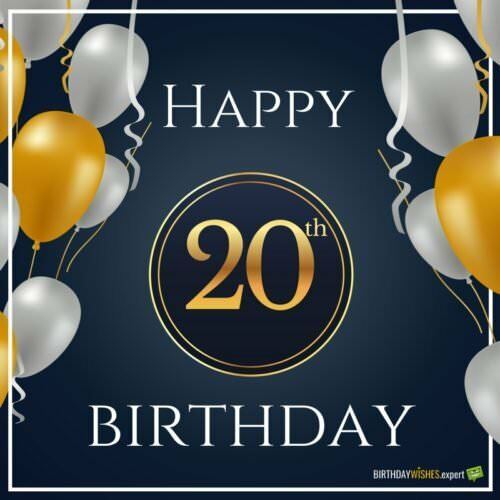 As you mark this great milestone of your life, may God bless you with happiness, health and prosperity. Thank you for bringing so much happiness into our lives. We love you, son. You’re growing up too fast! My warmest and heartfelt wishes to my beautiful and intelligent daughter. May God never stop blessing you. Happy 16th birthday to the most wonderful daughter on Earth. As you celebrate this special day of yours, we ask for God’s blessings and guidance in your life. Thank you for always putting a smile on our faces. We love you more than we can express in words. Happy 16th birthday to an amazing daughter! May your life be filled with happiness and success. We love you so much and are so proud of you. Happy birthday once again. I can’t believe you are turning 16 today, my beautiful daughter. My wish for you on this very special day of your life is that you enjoy every moment of your life and never stop believing in yourself. May God always guide and protect you. Happy 16th! I love you so much. Today is your 16th birthday, and it is without a shred of doubt a major milestone in your life. As you put out 16 birthday candles and enter this new stage of your life, I wish nothing but the best. May your heart always overflow with happiness. Happy sweet sixteen, my dear. Today is your big day since you officially turn 16. On this day, I pray that every desire of your heart that brings you pure happiness find its way to you. I love you so much, my sweet daughter. Have an astonishing birthday! The happiest and most precious moments of our lives have always revolved around you. We’re so lucky to be blessed with a daughter like you. May God always pour His amazing love and blessings upon your life. My sweet daughter, best wishes to you on your special day. May you never lose faith in yourself. May you always see success. And most importantly, may God always bless and keep you safe. I love you from the bottom of my heart. Have a wonderful and exciting 16th birthday. You’re growing up so fast! But no matter how old you become, you’ll always be my precious little angel. Have a wonderful birthday, my sweet angel, and know that my love for you is endless. Today is your special day, nephew. May this day bring you closer to achieving all the goals that you have set for yourself in this life. Celebrate this day, knowing that you can always count on me to be there to support you. Wishing my sweet niece a happy birthday. This is your special day, and I hope that you enjoy every single moment of it. Happy Birthday to my favorite Niece! This is your 16th birthday! And it is surely going to be one of the most exciting stages of your life. I hope you have an awesome birthday party. I wish you nothing but great things in life. Have a wonderful sweet 16th birthday, my dear. On this milestone of your life, I wish you happiness and all the sweet things of life. Happy sweet sixteen! No matter how much you grow, always remember that you’ll forever be my cute adorable nephew/niece whom I will always love. Happy sixteenth birthday. Happy birthday to the sweetest nephew/niece in the entire world. This milestone of your life calls for a big celebration. Today, you’re the star, and by Jove, we are surely going to celebrate you! It has been so beautiful watching you grow into such a wonderful young man, nephew. Have an astonishingly sweet 16th birthday. God bless you. Hurray! You are finally 16 years old. May all your dreams take flight on this special day. Soon you’ll be allowed to legally engage in all things that make life extremely fun. Happy 16th! Happy Birthday, Friend! You are an amazing friend and I am so honored to have you in my life. Thank you for being such a great friend. I hope you have many more fun adventures this year—and have me to tag along with! Sweet 16 will be positively sweet! My wish for you on this day is that exciting and happy things always come your way. Live life to the fullest and have a happy birthday, pal. You only turn 16 once in your lifetime, so make sure you get the most of this very exciting stage of your life. Happy 16th, bestie! Happy 16th birthday to my special friend who knows me inside out. May your day be filled with oceans of happiness and love. Have a great one. I feel so lucky to have you in my life, dear friend. My advice to you on this special day is that you never stop being you simply because you’re amazing. Have a super duper 16th birthday. We are surely going to have a blast today! Sending a bouquet of happiness and love to my awesome friend on her 16th birthday. I wish you a magical day filled with happiness and crazy fun. I can’t wait to set your sweet sixteen party on fire! Happy 16th to my bff. Thanks for making my life fun. I honestly believe my life would have been incomplete without you. I hope your 16th birthday is as fun and as wonderful as you. Love you. As you celebrate your sweet sixteen, remember that you only get to spend one year as a sweet sixteen, so I hope you enjoy every single moment of it. Happy birthday! Turning 16 is such a big deal, which is why today you and I are going to party and have fun like tomorrow doesn’t exist.